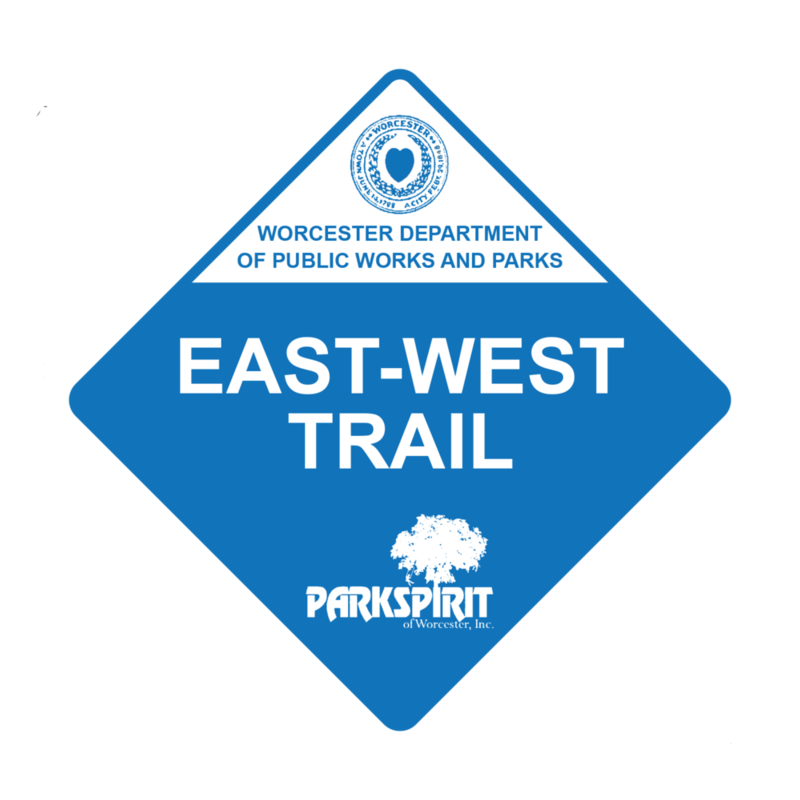 The East-West Trail — Park Spirit of Worcester, Inc. The City's own 14-mile, cross-city hiking experience, conncting 20 Green Spaces with city streets and throughways for a challenging trek through Worcester's hills. Extending from the shores of Lake Quinsigamond on Worcester's most Eastern boarder, the trail winds through city park, publicly accessible green space, and city street, taking the hiker across the city to Worcester's most Western boarder with Paxton and ending at the Cascades. The trail traverses the Coal Mine Brook, Trinity Woods, Green Hill Park, Grant Square Park, Rural Cemetery, Institute Park, Salisbury Park, Newton Hill at Elm Park, Beaver Brook Park, Hadwen Arboretum, Knights of Columbus Park, Columbus Park, Coes Park, John J. Binienda Memorial Beach, Tetasset Ridge, John W. Spillane Field, Boynton Park, Cascades West, Cascades Park, and Cascading Water. The East-West Trail traverses 20, publicly accessible green spaces. Together, 13 parks, 5 Greater Worcester Land Trust properties, 1 Arboretum (owned by Clark University), and 1 cemetery, create the East-West Trail. The East-West Trail has been a concept pursued by green space enthusiasts and advocates for many years, and and was taken up most recently by Rick Miller, Park Spirit Board Member and President of the Friends of Newton Hill at Elm Park, and Colin Novick, Executive Director of the Greater Worcester Land Trust. Miller and Novick began talk about the trail concept around 2001, when the portion of the Trail that cuts through Newton Hill at Elm Park was marked with blue trail blazes. In 2014, Novick produced a map showing how all 20 green spaces would be connected using city streets. In 2015, Novick and Miller presented the Trail concept to Park Spirit's Board of Directors, which voted unanimously to allocate funds to pay for the trail blazes. On July 4th, 2015, Miller and his daughter, Brittany Legasey, who at that time served as Director of Communications and Marketing for Park Spirit as well as an advisory board member for the Friends of Newton Hill at Elm Park, hiked the East-West Trail in its entirety. During the summer of 2015, the City of Worcester donated the labor of one of its Park Stewards Summer Work crews exclusively for the maintenance, clearing, and marking of the East-West Trail. The crew cut an entirely new trail in the wooded area directly below the Worcester Regional Airport and owned by the Greater Worcester Land Trust. In 2016, the City of Worcester donated the labor of another Park Stewards Summer Work crew for trail maintenance and marking. This crew was responsible for marking the trail's path over city streets by affixing reflective stickers of the trail blazes on light poles and nailing blazes to city trees. Thanks to the city's donation, the East-West Trail was officially implemented in August of 2016. To promote and encourage the use of the East-West Trail (as well as hiking and outdoor activity in Worcester in general), Park Spirit sponsors the 'Hike the Heart' campaign, featuring guided hikes at various times during the year. Since the first Hike the Heart Challenge was held in 2016, more than 30 hikes have been held, treating more than 150 hikers to unique outdoor experiences on the East-West Trail and beyond. In 2017, Park Spirit applied and was selected as a recipient of the Massachusetts Recreational Trails Grant Program. Park Spirit was awarded about $16,000 to fund the purchase of information signage and kiosks along the East-West Trail.